Mention the word, konbini [コンビニ] and you immediately think of onigiri[おにぎり]. They’re a staple for people all over Japan and as essential to konbini as last week’s coffee. Now, originally I was going to go straight into comparing these little morsels of rice but I decided to string it out because they’re just so Japanese and to really appreciate them you need background information. So, this is the first in a two-part series dedicated to one of my favorite konbini foods. 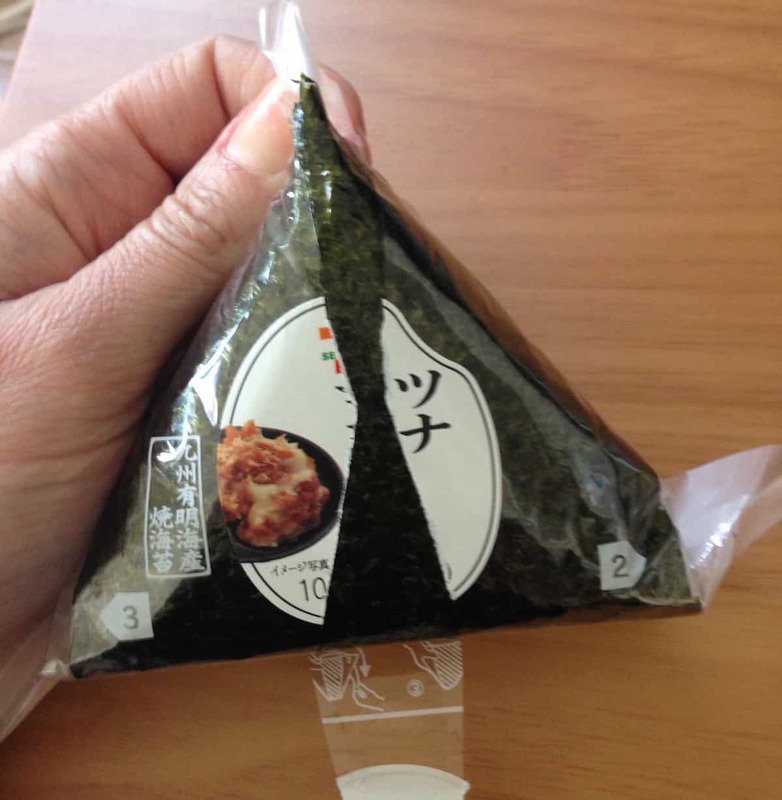 Basically, onigiri or omusubi [おむすび] are balls of rice that contain various delicious fillings and are usually wrapped in nori [のり], which is a type of seaweed. Children and adults alike adore onigiri and they’re the kind of food that you can eat for breakfast, lunch or dinner and even as a snack in between. They’re gentle on the stomach after a big night out (try the umeboshi [梅干し] one for a quick hangover cure that actually works!) and tasty enough to satisfy a craving for both sweet and savory foods. Sweet options include inari [稲荷], and savory… well anything like tuna mayo, salmon or just plain salted rice. They’re easy enough to make at home, but mine never look as good as the store-bought ones (okay, who I am kidding?! Mine don’t look ANYTHING like them!) Now, you are able to buy onigiri at supermarkets as well, but let me just tell you that opening those ones requires considerably more skill than the konbini ones. Remember, konbini food is… konbinient… I mean, convenient, so it makes perfect sense. I am a Master Onigiri Opener, but so, I have trouble with the supermarket ones. It seems though, that even the konbini ones do initially take some practice for us foreigners, as is evident by my mum’s experience last year. I introduced her to the tuna mayo onigiri at 7-Eleven and she basically subsisted on them her entire trip. Now here’s the funny part… Firstly, like any foreigner who is either super hungry or just can’t be bothered to read instructions, she failed miserably at the 1, 2, and 3 of how to unwrap them. This resulted in what my best friend likes to refer to as, “wrap rage,” and I was promptly given the task of trying to solve her mess. Secondly, I failed to notice for at least three days that she didn’t eat the nori. Yes ladies and gentleman, she unwrapped the rice like a present, with the nori flat on the table and proceeded to eat the rice, spilling it all over my apartment floor. She had the grace to laugh, but I still had to clean up the rice on my floor. Grrr! Next week I’ll review a few of my favorite onigiri from various konbini because as you know, I am not in a monogamous relationship with Mr. 7-Eleven. Great article. Each one makes me miss Japan even more!